The Sparc M7 is due for release next year and will eventually be used in both high- and low-end Oracle Unix systems, including the M series and T series products, said John Fowler, executive vice president for Oracle's systems business. 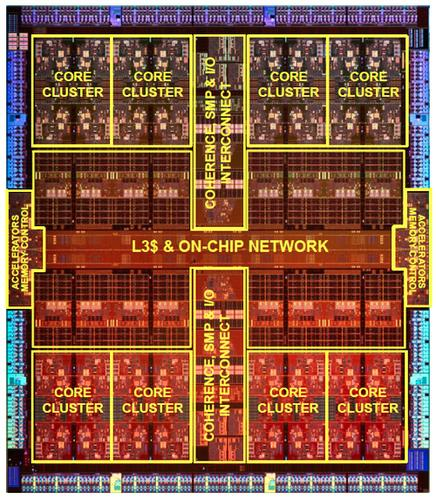 The chip has 32 CPU cores -- the same as the M6 before it -- but it's being manufactured on a more advanced, 20-nanometer process, which allows for smaller, faster transistors. It's also based on a new core design called the S4. The M7 will provide a three- to four-times performance boost for applications across the board, according to Fowler. But more significant for some customers, the chip has built-in accelerators that will yield much bigger gains for a handful of key tasks, he said. One of those is in-memory processing, where data is fetched from main memory instead of disk to reduce query times. It's one of the big selling points of Oracle's latest 12C database -- CEO Larry Ellison has said it will crunch data at "ungodly speeds." The M7 chip designers worked with Oracle's database team to build features directly in the silicon to accelerate in-memory operations. Fowler wouldn't give exact numbers but said it will yield "integer multiples" for common operations, meaning at least double or treble the performance over the Sparc M6. "Certain queries will be wildly accelerated," he said. The chip is also hard-wired to handle "live decompression," which should let customers keep more of their data in a compressed format and not pay a performance penalty when it's sent for processing. That in turn could reduce storage costs. Another feature built into the silicon reduces message latency between servers, reducing the performance overhead for database clusters. "If you want to gang together two systems, four systems, eight systems, the more you lower the latency, the more you improve the scalability, because you're not waiting for the memory interface," Fowler said. Yet another feature checks data in memory for errors resulting from a software bug or security exploit. Called "real time application data integrity," it's used now only for debugging and other non-production uses, but the Sparc M7 performs quickly enough for use with live applications. Oracle engineers gave an overview of the chip in a presentation Tuesday at the Hot Chips conference in Cupertino, California. It's Oracle's fifth new processor since acquiring Sun Microsystems four years ago. Some expected Ellison to sell off the hardware side of Sun's business, but instead he's focused on building costly, high-performance systems that tightly integrate Oracle hardware and software. The acceleration tweaks, including the in-memory and decompression features, will be "transparent" to users of Oracle's 12C database, Fowler said. However, they're not "unique or private" to the Oracle database, he said. That means other developers can program applications to take advantage of them. Oracle expects a lot of developers to use the application data integrity feature, for instance. The in-memory and data decompression features require more skill to take advantage of, but a company like IBM, for instance, could in theory tweak its database to take advantage of those features if it wanted to, Fowler said. Oracle isn't giving details yet of the systems the Sparc M7 will go into, but Fowler said the chip can scale to 32 sockets, like the current Sparc M6. He also said the same chip will be used in both T and M series systems.